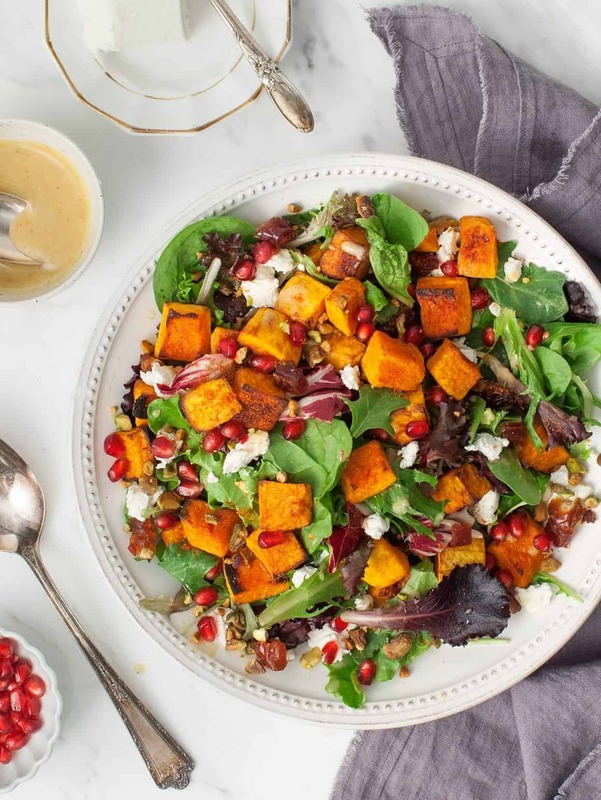 Roasted Butternut Squash Salad made with pomegranates, pistachios, goat cheese, and a cumin-spiced date dressing. Perfect for Thanksgiving or Friendsgiving! 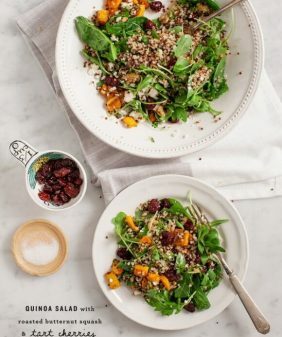 I created this crowd-pleasing fall salad recipe that I know both friends AND family members will love. 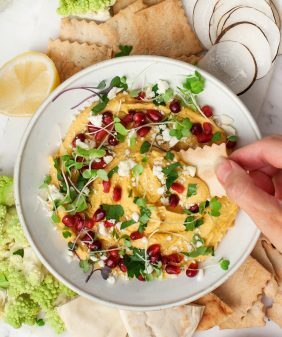 It’s the kind of salad that will convert any non-salad lovers because it’s filled with hearty roasted butternut squash (with some yummy spices), pomegranates, goat cheese, and pistachios. It’s a roasty, spicy, creamy, tangy combo that Jack and I are pretty obsessed with. But the food doesn’t stop with just my friends and family. To help bring more food to more people this holiday, ALDI is teaming up with Venmo and Feeding America® to encourage people to add a new tradition of giving to their Friendsgiving celebrations by using the very first Friendsgiving Turkey Hand emoji. Every time the Turkey Hand is shared on Venmo this November, ALDI will donate 10 meals to Feeding America to help people in need, up to one million meals. Learn more about the ALDI meal donations to Feeding America here. 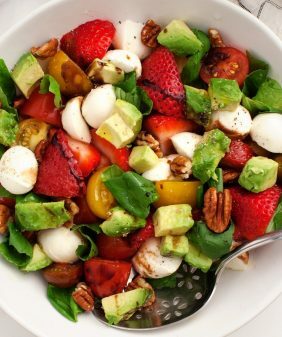 This salad recipe is super easy to pull off. Roast the squash, spice it, blend the dressing, and put it all together. 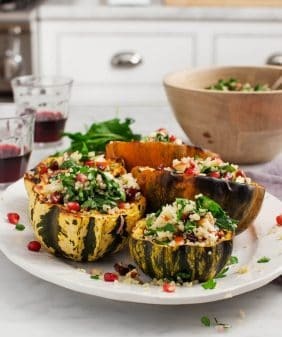 A tip for roasting the squash: I like to add the spice mix AFTER the squash comes out of the oven while it’s still warm so the spices don’t burn in the oven. Follow me on Instagram Stories on November 8th for more about the Friendsgiving festivities! Happy Thanks (and/or friends) giving everyone! Preheat the oven to 425°F and line a large baking sheet with parchment paper. Place the butternut squash cubes on the sheet and drizzle with olive oil and pinches of sea salt and pepper. Toss to coat and spread evenly on the baking sheet. Roast for 30 to 35 minutes, or until tender and browned around the edges. In a small bowl, stir together the cumin, coriander, cinnamon and cayenne. Set aside. Make the Cider Date Dressing: In a blender, combine the olive oil, vinegar, lemon juice, date, garlic, cumin, salt, pepper, and 3 tablespoons of water. Add 1 to 2 more tablespoons of water as needed to blend. Remove the butternut squash from the oven, let cool slightly, and, while warm, toss with the spice mixture. Assemble the salad with the spring mix greens and half of the roasted squash. 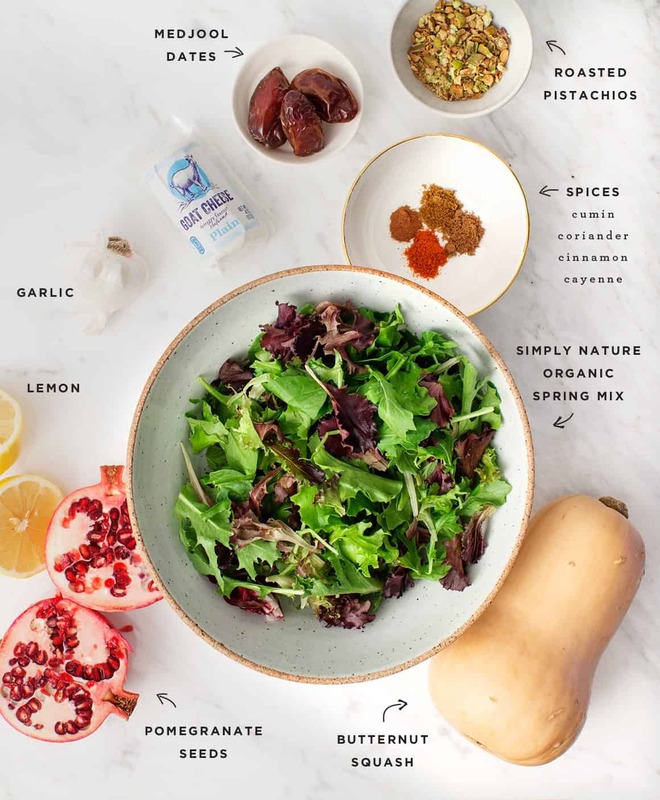 Drizzle with ⅓ of the dressing, toss lightly, then add the remaining squash, goat cheese, dates, pomegranates, and pistachios. Drizzle with more dressing as desired. Serve immediately. This salad sounds marvelous. I especially like that it has no garlic, because that means I could serve it when my sister visits. I’m going to have to start making fall salads! I hope you enjoy the salad! There is some garlic in the dressing, but you could skip it if your sister has issues with it. 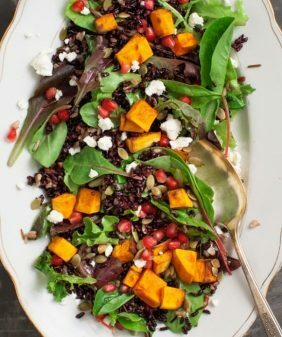 So many fall goodies in this salad—love it! Wow, looks like a great balance of flavors and textures. Love the pomegranate seeds! I’ve got a dinner tomorrow night and this would be perfect! Could I substitute the pistachio for a different nut/seed? Like pumpkin or sunflower seeds? you could – I would toast them with a pinch of salt before adding. Hope you enjoy the salad! it’s fixable! It sounds like either there’s not enough liquid in your blender (to get the blade moving well) or your dates were not super soft to begin with. I’d add 2 tablespoons of semi-hot water, let it sit for maybe 5-ish minutes. Blend again and see if that works. As long as the chunks are sort of even chunks, it’ll still be ok, it doesn’t need to be completely smooth to make a good salad. Let me know if that’s helpful! Hi, I’m going to bring a dish to someone else’s house for the first time and I know the oven is going to be reserved for the turkey. Any tips for making this ahead? 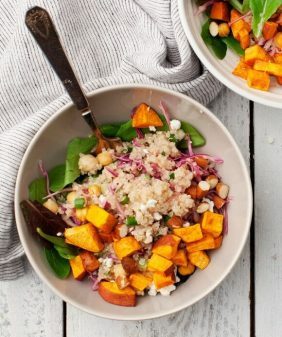 Could I reheat the squash in a frying pan or is that gonna get weird? Thanks! I would just reheat the squash in the microwave for 30 seconds or so (it doesn’t need to be hot hot). I would keep the dressing separate until you’re about ready to serve. Hope that helps! Thank you for creating the salad – so beautiful, easy to make, and delicious! Could go for a little spice in my salad. This looks great! WOW! This looks fanatstic. I think i make it for lunch today. Thanks for the recipe and the inspiration. Can you store leftover dressing in the refrigerator? Can’t wait to try this! yep, you can! If it gets thick, just stir in a little water before serving again. I hope you love the salad! Made this for thanksgiving and it was a huge hit! Thanks!